A tented wedding with glamour and elegance. Some couples spend months poring over every wedding detail, struggling to define their style. Alexandra Coffman and Nate Foulds were not one of those couples. 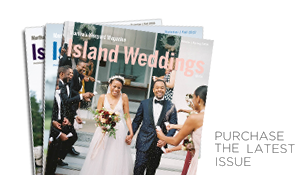 The pair met in 2013 and were engaged in 2015, but even before their engagement they had some ideas as to how they wanted their wedding to look: a fall ceremony at the Old Whaling Church in Edgartown, followed by an elegant tented reception. “We wanted a neutral space, but also wanted it to feel like we weren’t in a backyard somewhere,” said Alexandra. 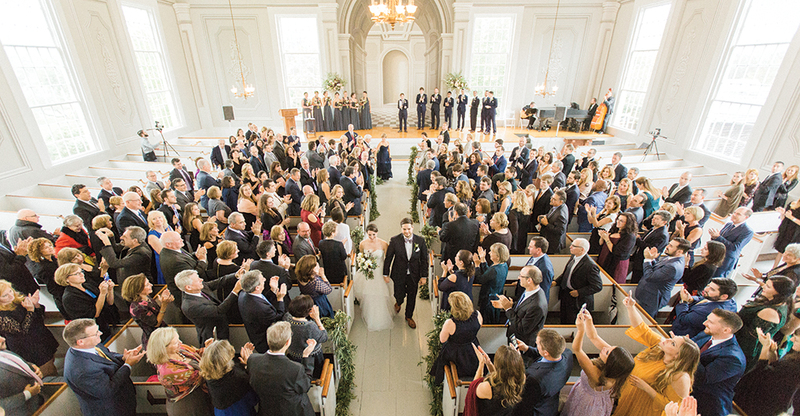 A quick check of fall availability at the church led them to their wedding date. From there, they booked their reception at the Field Club in Katama, of which Alexandra's parents are members. They were on their way, but the pair lead busy lives in New York and knew they would need help coordinating a party for 220 guests. They developed a divide-and-conquer strategy and assembled a team of experts. “I thought it was important to each pick a few things that are important to you, and don’t spend your energy on the rest of it,” Nate explained. For him, that included the music selection and beverages. “We spent the better part of the six months purchasing and collecting beer from our favorite breweries around New York and Boston,” said Alexandra. Nate also made blackberry jam for a signature cocktail. Alexandra handled logistics.